Elizabeth Taylor, one of Hollywood's greatest stars, has died at age 79. Taylor died Wednesday in hospital in Los Angeles, where she had been treated for congestive heart failure, her publicist Sally Morrison said. 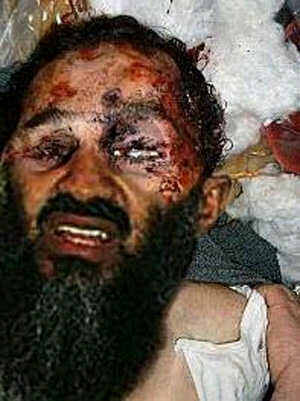 Osama bin Laden will not be missed! Bit suspect, considering a video of Saddam's execution was leaked, they haven't released any photos of a body, and now they've "buried" him at sea... (I'm not normally one to go for conspiracy theories either). Well, apparently the pic I posted is a fake. I'm not good at Photoshop so I won't argue. And we will probably never see a pic of him, also that pic was posted on a website in 2010 alrdy , many claim he's been dead since 07. I heard an official news report a while ago that said he'd been shot in the head twice, so that picture can't be right. They probably teebaged him also. With Eichmann and other Nazis it is a different story, because they WANTED to show the face of Nazi Germany, to go through the legal jabber, to show the mighty justice of the legal system etc. But then the media was different, technology was different. Then they needed to give a face, a symbol, to the Nazis and tell what they did via trial. With Osama, they didn't want to go through the legal system, everyone knows who he is and what he did, also probably because they didn't want incriminating information to go public (and I think that he knew a lot bad things about the American goverment), also now there could be rescue attempts, or taking hostages/threating to blow something 'and now you release him'. Osama was, and is, a symbol of terrorism, killing him is enough for public to go wild and get a feeling 'we accomplished something'. It was just safer for them to kill him I think. (No, I'm not a conspirator). And yes, especially for the americans, his death was a feeling of closure. But that doesn't mean that the war is over, not even a bit. While I also think that his death is the best ooutcome I condemn the killing of people. In this special case many more would've been killed during a law process or while trying to free him or press to free him. "BTW - OBL is dead - killed during whatever"
When they had the wedding stories up it was the same, but only from late Thursday night to Saturday morning and I think that was justified for that period. Once you'd done that you'd have some pointless trial somewhere (with even more media coverage), and a likely event for a terrorist plot. He'd end up going the same way as Saddam, abet after months (possibly years) of mumbo-jumbo and media hysteria, like I said least it is over. Sorry BB, I seemed to have skipped that sentence when reading your post! Macho Man died in a car accident. Jeff Conaway, the actor who made his name playing bad boy Kenickie in the movie Grease and as struggling actor Bobby Wheeler in the sitcom Taxi has died at the age of 60. Conaway had been hospitalised two weeks ago after he was found in a coma in his Los Angeles home. He never regained consciousness. Ryan Dunn, the 34-year-old "Jackass" star, died in a fatal car crash on Sunday night in Pennsylvania, MTV News confirmed Monday (June 20). According to police, the accident occurred at 3 a.m. on Route 322 and New Street in West Goshen Township. While it's unknown who was driving at the time, an unidentified passenger also died in the crash. April Margera, the mother of Dunn's "Jackass" co-star Bam, broke the news to WMMR 93.3's "Preston and Steve" radio show.